Use Creme Fraiche instead of mayonnaise if you wish. Also try some mixed nuts for a delicious flavour variation. To make the dressing, combine the lemon juice, mayonnaise and wholegrain mustard to a bowl and season with some salt and pepper. 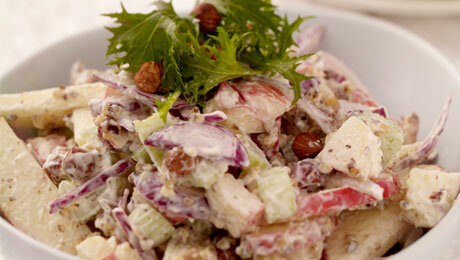 In a salad bowl add the thin apple slices, onion, celery and mix together until thoroughly combined. Next add the mayonnaise dressing, sprinkle the walnuts over the salad and serve immediately.